Many calendars come with a list of national (or international) holidays and important dates. Since LACRM has customers all over the world, we don’t include a default calendar of events. However, you can import national holidays and other important events into your LACRM calendar via our Google Calendar integration! This post will explain how to find, import, and sync national or international holidays to your Less Annoying CRM calendar. Note: You will need a Google account for this tutorial. If you don’t have one yet, you can create one for free here. 1. Find a calendar of events you can import into Google. If you’re looking for a different calendar, you can always search the internet. You can use search terms like “US national holidays 2020 free calendar download” to find what you’re looking for. Make sure to download the calendar, and double check that it is in .ics or .csv format. Here’s a nifty trick: if you aren’t sure what file format a download is in, you can hover your mouse over the download button. In the lower left hand corner of your browser, you’ll see a preview of the link for the file you’re about to download. If it ends in .ics or .csv, you have the correct file format! 2. Import the calendar into Google. Create a brand new calendar in Google, and import your events there. 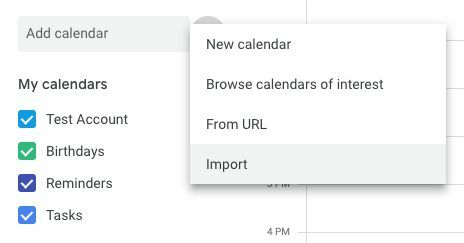 If you don’t want to touch your existing calendars in Google, or you want to make sure that only your holidays sync to the CRM (and no other events), this is the option for you. This tutorial from Google explains how to create a new calendar. Import your events into an existing Google Calendar. If you already have a calendar for major events that you want to sync over to the CRM, you can import your holidays into that calendar. In the next step, when we sync your Google Calendar with Less Annoying CRM, all of the events in that particular calendar will sync over to the CRM. Note: if you import the events into a Google Calendar that is already syncing with the CRM, your newly imported events will immediately sync over to the CRM. Once you’ve decided how you want to configure your events in Google, you can follow these instructions from Google for importing your events. You can start at step 2, since we’ve already exported your events! Once your events have imported into Google, spot check to make sure that your events are on the correct dates and the correct calendar. 3. Sync your Google Calendar with Less Annoying CRM. Note: if you originally imported your holiday events into a Google Calendar that was already syncing with Less Annoying CRM, you can skip this step — your events should already be in the CRM! Create a brand new subcalendar in Less Annoying CRM, and import your events there. If you don’t want to affect your existing LACRM calendars and events, or you want your holidays to show up in a different color on your LACRM calendar from the rest of your events, this option is for you. You can create a new subcalendar in LACRM during the syncing process. Import your events into an existing Less Annoying CRM subcalendar. If you already have a calendar for major events that you want to add your holiday events to, you can sync your Google Calendar with an existing Less Annoying CRM subcalendar. Once you’ve decided how you want to sync over your events from Google, you can set up the sync in Less Annoying CRM from the Google Integration page under Settings. You can follow this written tutorial or this video to sync Less Annoying CRM and Google Calendar. Note: if you decided to create a new subcalendar in Less Annoying CRM, during the step where you match your Google Calendars with the LACRM subcalendars you want them to sync with, be sure to select “Create new calendar”. Then, you can create the holiday subcalendar you need in Less Annoying CRM! If you don’t want to continue syncing with Google Calendar once your holiday events are in the CRM, you can turn off the Google Calendar sync from the Google Integration page under Settings. Your events will remain in the CRM, but nothing else will sync back and forth with Google. You can import calendars for more than just holidays! There are downloadable calendars for sport seasons, pop culture events, school events, and more. You can use these directions to get any other downloadable calendar events into your CRM.